On the eastern end of the Costa del Sol, 32 kilometres from Malaga and 8 from Mijas, Fuengirola is one of the most important tourist towns on the eastern Costa de Sol, its municipal area extending almost eleven square kilometres along the coast between Benalmádena and Mijas. The northeast boundary is the Arroyo del Jardín stream, and the south-eastern one is at the mouth of the Fuengirola River. In the extreme north the terrain is mountainous, speckled with housing developments. The area offers the best in tourism: beautiful landscape and everything for the tourist from the best restaurants to the top hotels, and a great deal more besides. Add to this the big marina, the nightspots and the numerous bars, and one has a very privileged town. Town Hall, Plaza del Ayuntamiento, 1.Fuengirola 29640. The cuisine of Fuengirola is what one would expect in any cosmopolitan place like this: the best of traditional fare with the best of international cooking to suit the sophisticated taste of the many thousands of foreign tourists that come here every year. The traditional cuisine of the area is based on fish and seafood, with sardines on the spit and fish cooked in salt the favourites. One of the best areas for restaurants is along the esplanade itself. 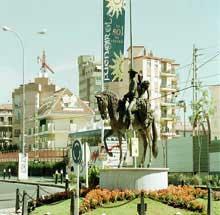 The big festival in Fuengirola is the feria in honour of the Virgen del Rosario, and it takes place in October. The Holy Week celebrations are very important here too, as is the noche de San Juan, the night of San Juan, which takes place at the summer solstice. Another event not to be missed is the festival of the Virgen del Carmen, patron saint of the sea. During the month of August there are a number of festivals and cultural activities, such as the Festival Ciudad de Fuengirola, which takes place in the castle. The esplanade in Fuengirola, called the Paseo Marítimo Rey de España, is one of the longest in the country. Its almost seven-kilometre length looks out over beaches with chiringuitos and restaurants along the way. Here too is the marina, a pleasure port of the first order, filled with bars and good restaurants and, of course, all types of boats. Tradition and modernity meet here, with the fishermen’s boats sharing this space too, and a street market there on Sundays. The marina can hold 226 boats, about half of them there on a temporary basis. Sohail Castle is one of the most interesting buildings in the town, and following the work carried out there, it is currently used for holding cultural events, like the Festival Ciudad de Fuengirola. Opening hours are 10 to 2 p.m. and 6 to 9 p.m., and the building is closed on Mondays. There is a small museum inside, showing different aspects of the castle. Las Palmeras(4*). Paseo Marítimo, 46, Fuengirola. Hotel Las Pirámides(4*). Miguel Márquez, 43, Fuengirola. Hotel Angela(3*). C/Jaen, 2, Fuengirola. Hotel PYR(3*). Lamo de Espinosa, 6, Fuengirola. Hotel Stella Maris(3*). Paseo Marítimo, 54, Fuengirola. Camping Fuengirola. Ctra.340 Km. 207, Fuengirola. Camping. Camping La Rosaleda. Ctra.340 Km. 211, 5, Fuengirola. The origin of the name Fuengirola is probably Spanish rather than Roman or Moorish, having no connection whatsoever with the Roman Suel or Arabic Sohail and deriving from a type of ship that used to dock here. The Phoenicians settled here on the hill outside the present town centre that the Romans later built a castle on, calling it Suel, and this soon became the focal point of the settlement. It also became an important part of the defensive line against pirate attacks from the coast. The ruins of the castle can be clearly seen on the hill from the main coast road into the town from Marbella. Fuengirola became an independent municipality in the 1953, quickly growing into the busy tourist town it is today. Among the most important of the archaeological remains in the municipality are the Roman hot baths at Torreblanca, the remains of various Roman roads in the area, Cañada Real and the marble pieces found in the Mijas quarries. These were used to build a monument in the form of a temple in the Plaza de Castilla in Los Boliches. The Visigoths were, in fact, the first to settle here, but more in passing than as permanent residents. The Moorish presence was consolidated from the 8th century onwards, and evidence of their settlements is the burial ground discovered near the hot springs at Torreblanca. It was from this period that we get the name Sohail, a bastardisation of the Latin Suel. It was destroyed in a Viking raid in 858, and the people took refuge in Mijas. It was not until the 10th century that the Cordoba leader, Abderramán III, reconstructed the fortress and re-built the urban centre, and it remained in Moorish hands until captured by the Christians in 1487. The castle was reconstructed again in the 18th century with the aim of fighting smugglers in the area, and from then on the town became an important supply centre for ships sailing towards the Straits of Gibrtaltar. It was at this time that the place became definitively known as Fuengirola, the name deriving from a Genoa ship called a “girona”, that frequently made harbour here, trading in groceries (boliches). Thus the name Los Boliches, formerly separate from but now forming part of the same urban area as Fuengirola.